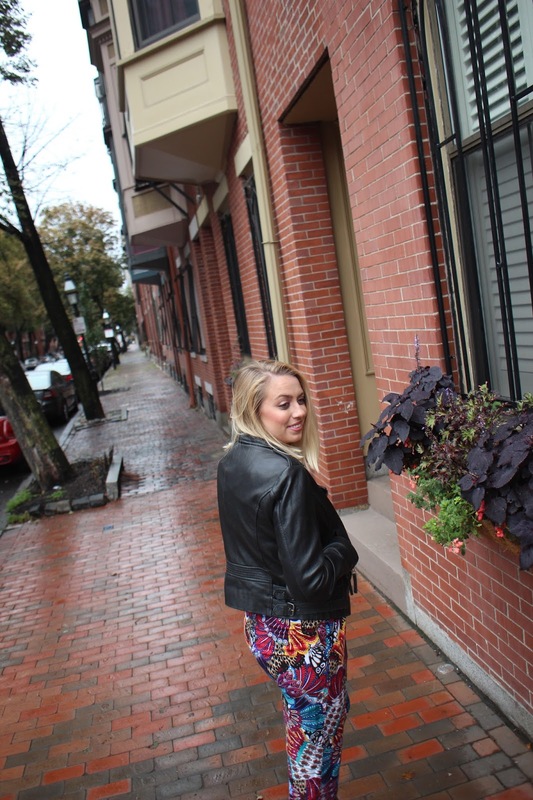 smilingrid: My most colorful fall outfit! feat. high-waisted pants, a leather jacket, and a bright clutch! My most colorful fall outfit! feat. 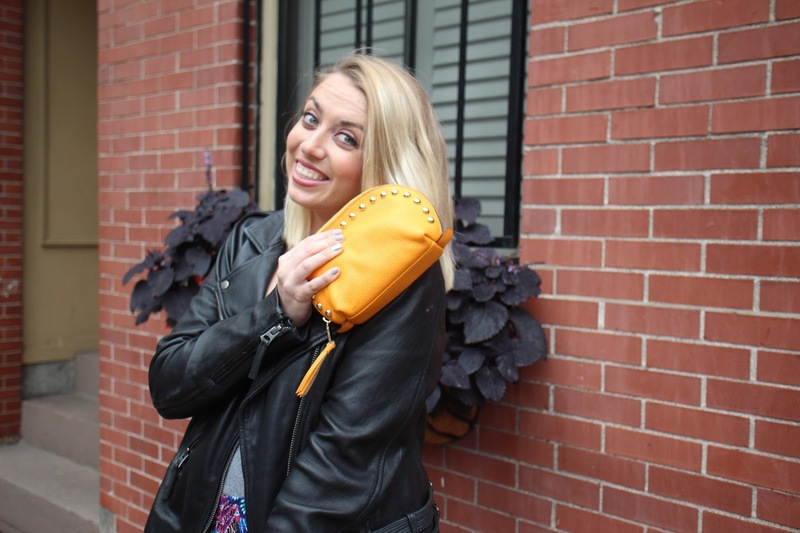 high-waisted pants, a leather jacket, and a bright clutch! Have you ever noticed that as the fall colors erupt and catch flame around us, fall fashions tend to get a little monochromatic (save for plaid, obvi)? Don’t get me wrong, I’m all for the thick-knit cream sweaters and the expected pops of plaid, but sometimes I feel like I have to fight the tide! 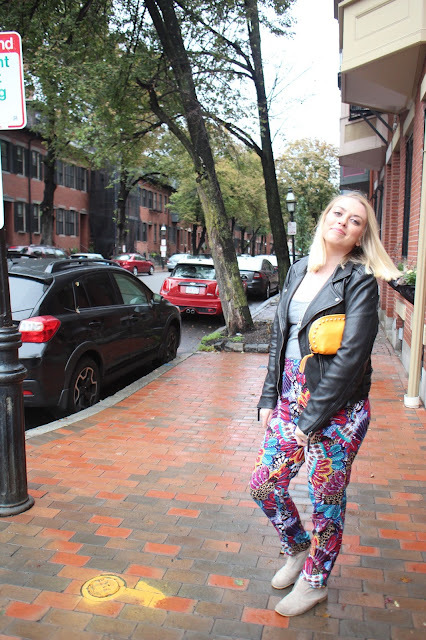 Luckily, when I decided to don my most colorful pants this past rainy Sunday, my roomie was there to snap some pictures! 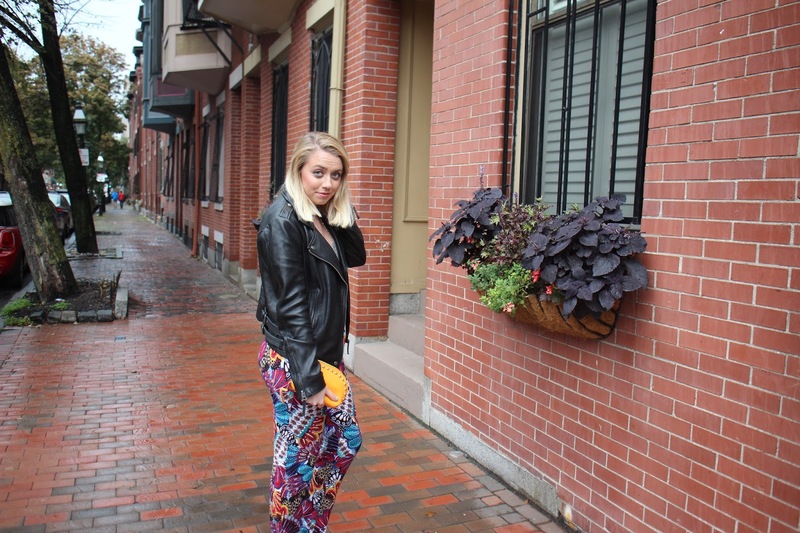 These pants (which I just got from poshmark! 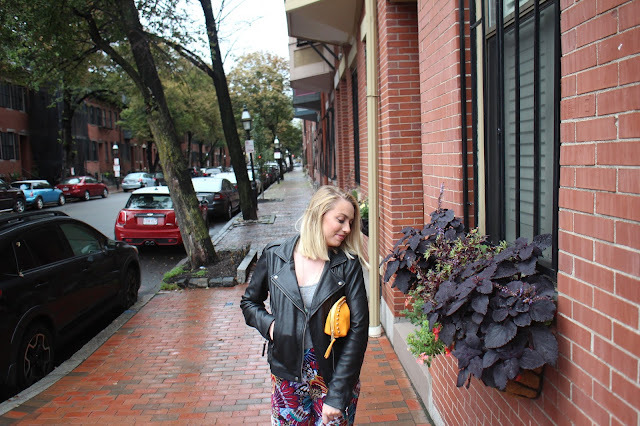 Come shop my closet here) took me from brunch in our neighborhood to playing with puppies at Barktober fest and exploring SOWA’s vintage market (that post will be up soon-ohmygosh so many cute pups in costumes your heart will melt)! They’re still sort of summery in weight, but the full length and styling it with my favorite leather jacket brings them into the fall. I’m sure I could also wear tights underneath to extend their wear time even further! As I was super distracted by all the aforementioned cute puppies in halloween garb, I almost missed the slew of compliments I got on my colorful-patterned bottoms! 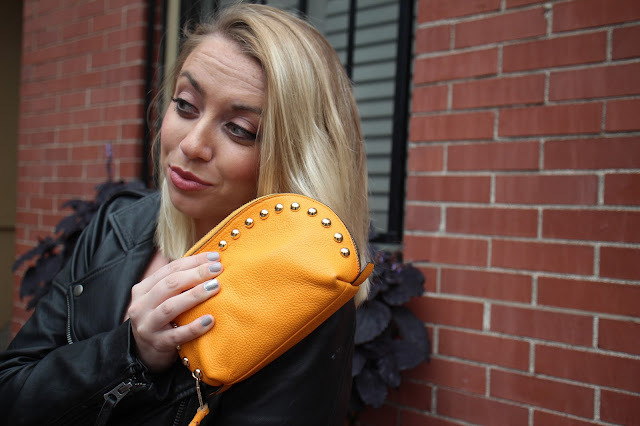 Seems like the general public wants more color in fall wardrobes and I, for one, am beyond happy to oblige. 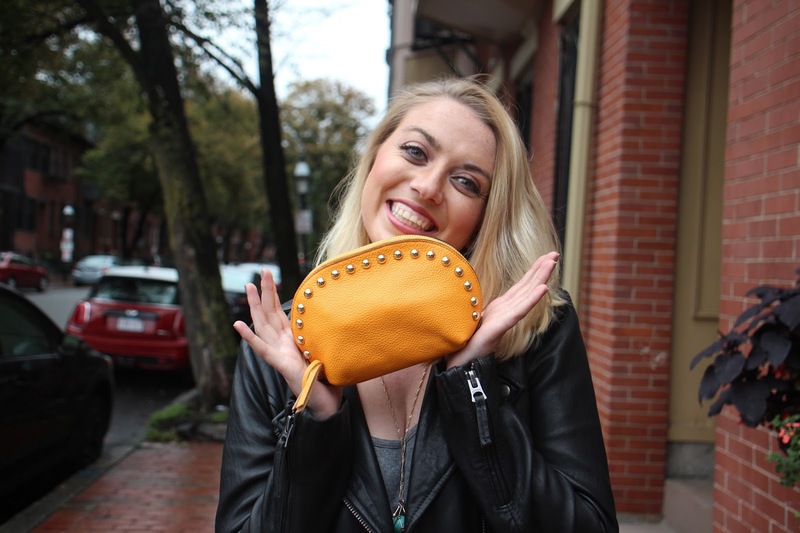 Plus, if we’re talking colorful-for-fall, how perfect is this Rebecca Minkoff clutch? You might have heard by now: this was an amazing College Fashion Week goodie bag grab! I totally could have also grabbed my other one (omgomgomg I still can’t get over the fact that I have two!) 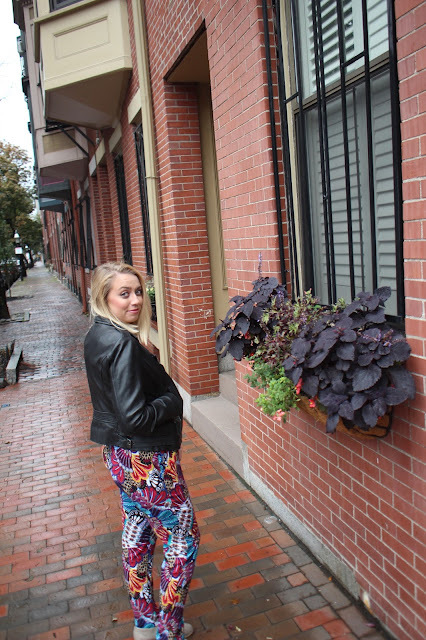 and matched the colorful tassels with the multitude of colors on my pants… which do you think would be cuter? pants from Tobi, tank five-ever old, jacket from Lucky, Shoes are Franco Sarto, and necklace was a gift! What did you get up to over the weekend? What’s your favorite color-packed outfit? 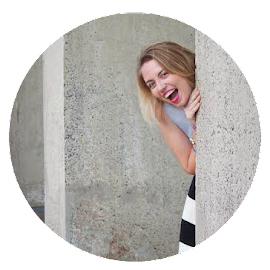 PS- don’t forget to enter my Fitbit giveaway! On Moon Bitcoin you may get free bitcoins. 163 satoshis every 1 hour.